On November 5th~8th, ‘2018 Global Commercialization Workshop’ took place in KAIST, Daejeon. 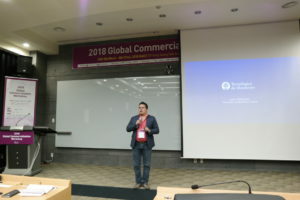 It was hosted by the Ministry of Science and ICT and KAIST and organized by KAIST Global Commercialization Center (GCC), KAIST ITTP and SNU ITTP. Under the topic of ‘Global Commercialization Workshop for Innovative Development’, R&D and industrial sessions were held during the 3 days. Multiple experts of various fields, government representatives, industry partners and R&D researchers and more participated this event. In addition, ESCCK Secretary General, Mr. Roger Royo, and Representative in South Korea at CDTI, Mr. Jordi Espulga, attended as speakers. Specifically, on November 5th at session 2, Mr. Jordi Espulga talked about the ´Technology Demands from Foreign Partners´. On November 7th, Mr. Roger Royo presented about the ´Start-up environment in Spain and Technology Commercialization´ in session 6. 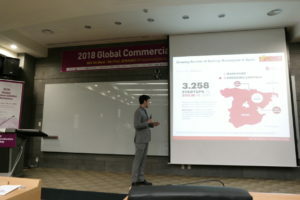 ‘2018 Global Commercialization Workshop’ was held successfully during the 3 days. It was an opportunity for people to get together to share information and ideas, and find possible ways of collaboration.